Description All your X-Banner Stand will be sent as individual units by parcel delivery. Your X-Banner Stand will be sent in two separate deliveries – one by pallet, one by parcel. Low cost, high impact banner display. Simple fold-away design – no tools assembly. 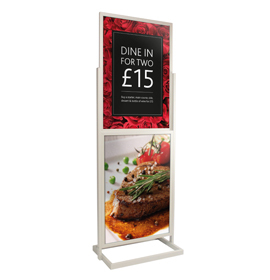 Displays 600 × 1600mm eyeleted banners in a wide range of materials (available made to order). Banners simply hook into place – quick and easy to remove and replace. Carbon fibre top poles provide excellent tension and stability, ensuring banners do not sag over time. Black canvas carry bag included (extra durable black carry case also available). Front Lit PVC is recommended as banner choice.